The American Simmental Association (ASA) and Holstein Association USA (HAUSA) have announced the formation of the HOLSim™ branded program. The program identifies elite SimAngus™ bulls with specific production attributes as mating solutions for dairy producers who breed some of their herd to beef. US cattlemen and women have successfully improved beef quality during the last several decades, yet capturing widespread carcass data proves elusive. The most important traits are still among the most difficult to predict. A large-scale project from the American Simmental Association (ASA) aims to change some of that - and arm ranchers with more accurate decision-making tools. Bozeman, MT — The American Simmental Association (ASA) is proud to announce the winners of the 2018-2019 Ring of Champions contest. The Ring of Champions program recognizes cattle that have been consistently successful at ASA’s major Progress Through Performance (PTP) shows, reflecting an industry reality where producers routinely balance between phenotypic evaluation and scientifically relevant EPDs and Indexes. The PTP shows included in the Ring of Champions are: the American Royal, Kansas City, MO; North American International Livestock Exposition, Louisville KY; National Western Stock Show, Denver, CO; and Fort Worth Stock Show and Rodeo, Fort Worth, TX. Bozeman, MT — Darla Aegerter, Seward, Nebraska, has joined the American Simmental Association as the Youth Programs and ASF Foundation Manager. Aegerter’s main responsibilities are to coordinate the AJSA Regional and National Classics, other assigned youth events, work closely with the AJSA Board, and become immersed with the American Simmental-Simbrah Foundation as liaison with the Foundation Board and support their fundraising activities. Aegerter has an extensive background in the purebred cattle business, including operating her own livestock photography business, managing livestock advertising sales, serving as the Nebraska State Fair Beef Superintendent, and assisting with special projects at the American Hereford Association and Hereford Youth Foundation. Bozeman, MT — Gordon Hodges of Hamptonville, North Carolina, a member of the American Simmental Association (ASA) Board of Trustees Executive Committee, has been elected Chairman of the Board, succeeding Tim Smith of Giddings, TX. Hodges has served on the ASA Board of Trustees twice, elected in 1990 and 2014. Hodges, who served on the ASA Board of Trustees for the first time from 1990 to 1996, has been breeding Simmental cattle since 1970 and operates Pineview Farms. His SimAngusTM and Simmental seedstock herd of 60 cows has operated for the past five years in a management partnership with Bradley Gibbs. Hodges has also served as a Genetic and Marketing Manager for Gibbs Farms since 2006, a SimAngus & Simmental operation of 800 cows in Ranburne, AL. Bozeman, MT- Ron Miller been named the recipient of the American Simmental Association’s (ASA) 2019 Lifetime Promoter Award. The award recognizes individuals and organizations that have made significant contributions to the development of the Simmental/Simbrah breeds. The Lifetime Promotor is one of the highest awards given by the ASA. For more than five decades, Ron Miller has been an effective voice for the beef industry, including Simmental. Growing up on a farm/ranch at Cambridge, Nebraska, his work with beef cattle began at a very early age. Immediately after high school in the 1960s, he established his own fitting and showing enterprise, exhibiting his own cattle along with those of his clients. Bozeman, MT- J.W. Brune been named the recipient of the 2019 Golden Book Award. The award recognizes individuals and organizations that have made significant contributions to the development of the Simmental/Simbrah breeds. The Golden Book is given on behalf of the World Simmental Fleckvieh Federation (WSFF) and is the most prestigious award given by the American Simmental Association. Brune and his wife, Carol Lyon Brune, DVM, are the owners and managers of White Star Cattle Company. They maintain both a spring and fall-calving herd consisting of purebred to percentage cattle marketed by a variety of means, including private treaty, bull test sales, and breeder group sales. A member of both the Missouri and Kansas Simmental Associations, Brune is also active in numerous other livestock organizations. A veteran of the US Army, he served a tour of duty in Vietnam and received a Purple Heart for wounds received in combat. Bozeman, MT — Clay Lassle of Glendive, Montana has been re-elected to the American Simmental Association (ASA) Board of Trustees and will continue to represent the Western region. Lassle’s affiliation with Simmental cattle dates back to 1974 when the Lassle Ranch introduced the breed through AI. This past year, Clay’s daughter, Sarah, and her husband, Ryan, and their two daughters came back the ranch full-time. Clay’s wife, Marianne, keeps the books and “keeps everything running,” and their other two children, Stephanie and Travis, help as time allows. Their herd of 300 cows ranges from purebred Simmental to SimAngusTM. Genetics are sold through an annual bull sale, and held the second Thursday in February, while select females and replacement heifers are sold through various outlets. Bozeman, MT — Tim Curran, Ione, California has been re-elected to the American Simmental Association (ASA) Board of Trustees and will continue to represent the Western region. Tim Curran and his wife, Jill, maintain Circle Ranch, a herd of primarily SimAngus™ females in the foothills of California’s rugged, majestic Sierra Nevada mountain range. Cattle winter at lower elevations, but summer above 5,000 feet. His cow herd is comprised of 80% seedstock while 20% are commercial females. Genetics are marketed through the Beef Solutions Bull Sale, held annually on the fourth Thursday of September in conjunction with an area Angus breeder, Bruin Ranch. Curran sells 100 SimAngusTM bulls through the sale and another 60 SimAngus bulls by private treaty. Bozeman, MT — J.W. Brune, of Overbrook, Kansas, has been elected to the American Simmental Association (ASA) Board of Trustees and will represent the North Central region. Bozeman, MT — Greg Walthall, of Windsor, Missouri has been elected to the American Simmental Association (ASA) Board of Trustees and will represent the South Central region. The owner/operator of WW Cattle Company, Greg Walthall, has been active in the Simmental business for a total of 47 years. The WW cow herd currently consists of 50 head of purebred Simmental and SimAngus™ females. Through the utilization of in-vitro fertilization, embryo transfer, and artificial insemination, his focus is primarily on producing and developing low-input, forage-utilizing females. Cattle are marketed through a variety of methods, including consignment sales, online, and by private treaty. Recently, the American Simmental Association (ASA) Board of Trustees passed a directive to put significant effort into the collection of sire-identified carcass phenotypes. This is an understandably large undertaking and we need your help. Let's face it if you are a seedstock breeder we do not expect to receive a significant amount of carcass data from your herd, as the bulk of your animals become breeding stock. Rather, the path to increased carcass collection lies in the customers of yours who trust your genetics and retain ownership through slaughter. It's likely you are already thinking of those couple producers you sell bulls to that retain ownership. It wasn't that long ago that ASA rolled out the commercial Total Herd Enrollment (THE-CM) option, specifically geared for the commercial cattlemen. This option was designed to offer a home for those commercial cow-calf operators who wanted more in terms of genetic awareness on their cowherd. This is where we believe we can help. For those commercial producers who are already taking on the risk of retaining ownership, who are data-driven, and interested in better understanding the genetic merit of their cowherd we would like to assist them by enrolling their cowherd into THE-CM. For just $500/per year, with no limitation on herd size, the ASA will provide membership, access to Herdbook and Active Herd management software, EPD's and selection indexes powered by BOLT on the producer's entire female population, and the opportunity to take advantage of the many other programs offered by ASA. This is an opportunity for your customers to take their herds to the next level, benefit the ASA genetic evaluation, and even better they will help prove your genetics faster. That's right. By introducing additional contemporary groups tracing back to your genetics, your own EPDs will become more accurate. More powerful predictions, improved accuracy, and more meaningful carcass EPD's can all be achieved on your cowherd by integrating your customers' cowherds into THE-CM. Call Lane Giess or Jannine Story at 406.587.4531 if you have customers who may be interested. Starting September 1, 2018, DNA invoicing will be completed at the time of requesting the tests (instead of when results are received). This will increase efficiencies and reduce the number of invoices members currently receive. Since it takes time to order kits and for the sample to complete testing, other types of processing (registrations, THE enrollment, transfers) will not be delayed pending DNA payment for a period of time. The Genetic Conditions Panel is undergoing changes to include all 7 of the genetic defects tracked by the American Simmental Association. These defects are: AM, NH, CA, DD, OS, PHA, and TH. The new Genetic Conditions Panel will only be available with GGP-LD or GGP-HD testing and the add on price for the panel will be $25. If the animal is not undergoing a GGP-LD or GGP-HD test, then defect testing will be $25 per defect. If requesting the genetic conditions panel after a GGP-LD or GGP-HD test is complete, then the testing will be billed at single defect rates, which is $25 per defect. ASA has expanded the opportunities for you to request a knowledgeable person to an event. This may be in a formal presentation, one of the speakers at an event, or a few minutes in front of the crowd with an invite to consult one-on-one about ASA's programs and services. 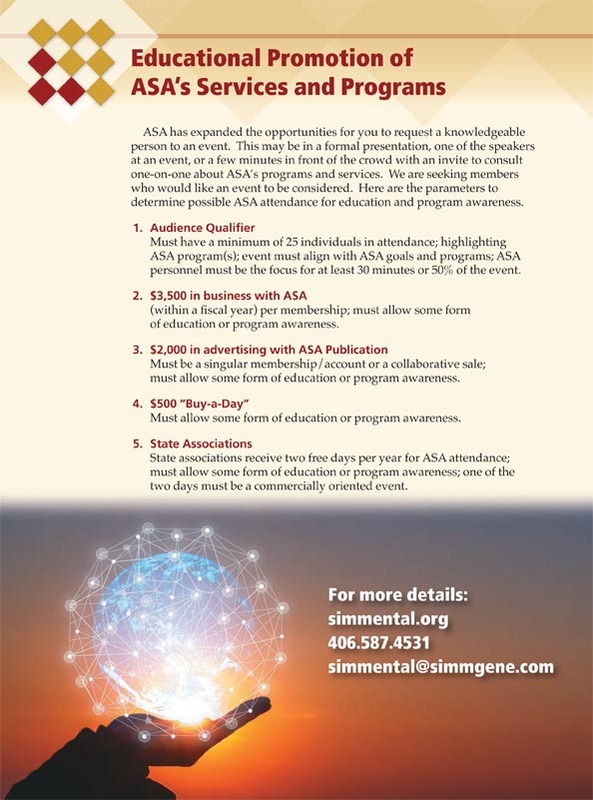 We are seeking members who would like an event to be considered; here are the parameters to determine possible ASA attendance for education and program awareness. 1. Audience Qualifier. Must have a minimum of 25 individuals in attendance; highlighting ASA program(s); event must align with ASA goals and programs; ASA personnel must be the focus for at least 30 minutes or 50% of the event. 2. $3,500 in business with ASA (within a fiscal year) per membership; must allow some form of education or program awareness. 3. $2,000 in advertising with ASA Publication. Must be a singular membership/account or a collaborative sale; must allow some form of education or program awareness. 4. $500 "Buy-a-Day"; must allow some form of education or program awareness. 5. State Associations. State associations receive two free days per year for ASA attendance; must allow some form of education or program awareness; one of the two days must be commercially oriented. Contact Luke Bowman at 765.993.6681 for more information. Are the New BOLT-Derived EPDs More Accurate Than Previous Cornell EPDs? International Genetic Solutions (IGS) is an unprecedented collaboration between progressive breed associations fervently committed to enhancing commercial profitability. The collaboration has yielded the world’s largest genetic evaluation of beef cattle with over 17 million animals and 120,000+ genotypes. In keeping with our commitment to the cattle industry, IGS is pleased to announce the IGS Multi-breed Genetic Evaluation powered by BOLT. The new genetic evaluation provides more predictive EPDs, better use of genomics, more accurate accuracy reported with EPDs, all with weekly evaluations. The announcement ushers in a new era in genetic evaluation — an era made possible by a genetic evaluation system dubbed BOLT (Biometric Open Language Tools, owned by Theta Solutions, LLC). The April issue of the Register is out! Be sure to check out this month’s feature on Southern Cattle Company, the AJSA National Classic Preview, and much more. The commercial programs offered by the American Simmental Association (ASA) are an effort to provide genetic tools to the largest sector of the beef industry— the cattle operations. Click here to read our article. Join the ASF Auction Following the Foundation Gala, Sunday Evening, January 20, 2019, in Denver at the DoubleTree Hotel (3203 Quebec Street). The auction will also be online at LiveAuctions.tv. Visit www.simmental.org/foundation for auction details and to view the auction items! Just how long does it take to get from a DNA test request to a result on Herdbook? Give yourself a two-month head start to be sure. Check this link to learn more about testing requirements, timelines, and top tips for success! For a quick refresher on updating your THE inventory - read and follow our blog Have U Herd? Got pics? ASA Publication, Inc. is always looking for photos for the Register and SimTalk: covers, editorial, and advertising. The vertical format works best for front covers, both vertical and horizontal advertising and editorial. $100 for every photo used on the cover of the Register or SimTalk and $50 for every photo used in an ASA ad or editorial. The one-time payment will be rendered upon the use of the photo. All photos become the property of ASA and ASA Publication, Inc. Include a detailed description of location and cattle along with complete contact information: name, address, and phone number. Unprecedented awareness of your feeder calves. No cost! The IGS Feeder Profit Calculator identifies the relative value of your feeder calves and provides a third-party certification to data-driven buyers. Follow the link in our profile to learn more today! Know. Or guess. You decide. Louisville is the second of four major PTP shows that make up the Ring of Champions program. Dr. Wade Shafer addressing the World Simmental Fleckvieh Federation Congress at Ft Worth Texas. Photo credit: Fred Schuetze. View the presentation in two segments: View part one. View part two. Cathy Eichacker, the newest member to the Foundation, grew up in Salem, SD. Eichacker married her high school sweetheart, Steve, and they moved to the family farm and continued growing the Simmental herd that Steve’s dad, Raphael, started in 1971. Raising registered Simmental cattle was a bit different for Eichacker since her family raised hogs and had a small herd of commercial cattle. Eichacker & Steve have three children, Amanda (Dana) Buttemeier, Nick (Jordan) Eichacker, and Adam Eichacker, and three grandchildren, Hunter, Taylor & Ellie. Eichacker worked as an Assistant Finance Manager for 25 years before deciding to transition back to working full-time on the farm. Along with working on the farm, Eichacker has been a volunteer for the County Fair Board, 4-H Leader, the Salem Summer Youth & Rec, and many organizations for St. Mary’s Catholic Church. For the past 20 years, Eichacker has been the junior advisor for the South Dakota Junior Simmental Association and has also served as Secretary on the South Dakota Simmental Association (SDSA) Board. The SDSA has hosted the North Central Regional Classic twice in the past six years with Eichacker taking the role as coordinator. “Working with our youth, the future of our breed has been such a delight, watching these kids grow each year from crying the first time they took the Cattleman’s Quiz, to getting up enough nerve to compete in the public speaking contest, and then winning a prize. The smiles on their face are priceless,” she states. Each year state associations host to the largest SimGenetics event in the country, one of the most prestigious youth livestock events, the AJSA National Classic. With each year’s National Classic bigger than the last, more and more SimGenetic enthusiasts attend the National Classic and purchase SimGenetics; at the same time, state associations are saddled with a growing financial responsibility in hosting. Help lighten the load by contributing and ensuring many years of AJSA National Classics to come. Bob, Jamie, Michael and Jamey Mullion operate Red River Farms, a diversified farming operation in the Palo Verde Valley, along the Colorado River near Blythe, California. They run 150 purebred and SimAngusTM females on irrigated pasture, focusing on performance, calving ease, and phenotype. Bob managed a full blood operation in Colorado following graduation from Cal Poly, and has been passionate about the breed ever since. Mullion is a strong believer that the future of the Simmental breed is dependent upon its youth and is an avid supporter of the Western and National AJSA programs. One of his greatest joys is watching his granddaughters, Madison, Logan, and Hayden in the showring. Scott Cowger purchased his first Simmental bred heifer in 1982 which led to an active involvement with the AJSA growing up. Cowger then became active at a state level in Missouri. He has served on the Missouri Simmental Association board as well as the ASA Board for three years. His involvement has rubbed off on his daughter Jordan, who is currently the AJSA President. Scott and his family enjoy attending the AJSA National Classic each year. He believes that the Simmental breed has the best National Classic with the various events youth compete in to become well-rounded individuals. This involvement over the years leads to their giving to the Foundation. Being involved with this breed for over 35 years he is a passionate believer in the American Simmental Association and its members. Cowger states, "The future is very bright in our youth and the scientific data we as a breed have compiled is second to none. Ensuring the future of our breed for years to come would be the biggest reason someone should support the foundation. There are numerous areas of interest and working cooperatively through financial donations would greatly assist the breed for years to come." AJSA Canadian Exchange Project. Each summer, two AJSA Board of Trustee members are randomly selected to attend the Young Canadian Simmental Association National Classic. This is more than just an opportunity to travel, but rather an opportunity for AJSA members to learn about international agriculture, and gain new friends in an attempt to build their resume and personal experience. Employer: Owner of Eberspacher Ent Inc Sale Management for 30 years. Lori Eberspacher is no stranger to the Foundation. Along with her husband, Val, Eberspacher lives in Marshall, Minnesota, where they operate Eberspacher Enterprises Inc. Sale Management. Both Val and Lori were raised on purebred operations, as well as raising their daughter, Amanda in the cattle industry. The seedstock business is near and dear to their hearts. The Eberspachers have been promoting the Foundation and the AJSA for the past 21 years, and Lori has strong conviction toward the cause. Established in 1981, the Merit Award is designed to provide recognition to junior members who have made “significant contributions to their community, home, family, school and the Simmental or Simbrah breeds of cattle.” As college tuition continues to increase, the Foundation continues to support 16 AJSA members each year by awarding over $26,250 in scholarships, 11 Silver Merit Awards and 5 Gold Merit Awards, to help them continue their collegiate educational endeavors. Tonya Phillips grew up in Iowa and was a member of the Iowa Junior Simmental Association. She and her brother were fortunate enough to exhibit two Simmental heifers across Iowa and attend regional and national events. Phillips absolutely loved her time in the AJSA and also served on the AJSA Board of Trustees. She met her husband Chan while attending one of the National Classics. Phillips shares, “We both realized the value of the AJSA and the lifelong skills that juniors learn. We knew that we wanted our children involved as well. There are many areas that donors can designate their funds within the Foundation.”. She encourages people to contribute to the area that they are passionate about so that area can be expanded and help educate members. A teacher for 27 years, Tonya will be retiring this month and moving to Oklahoma. Chan and Tonya have two children: her son, AK, who is an active AJSA member, and Morgan, former AJSA President, who recently married Sam Wallace. AJSA Canadian Exchange Project: each summer, two AJSA Board of Trustee members will be randomly selected to attend the Young Canadian Simmental Association National Classic. This is more than just an opportunity to travel, but rather an opportunity for AJSA members to learn about international agriculture, new ideas to progress the association, and gain new friends in an attempt to build their resume and personal experience. Employment: Little Creek Farm, LLC and retired from the College of Veterinary Medicine at Mississippi State. Mikell Davis, DVM is retired from the College of Veterinary Medicine at Mississippi State University. His family owns Little Creek Farm, LLC (ASA 182335) which purchased its first full Fleckvieh Simmental cattle in 1993, and maintains the herd today. Davis enjoys attending sales for the personal interaction with other cattle breeders. As a supporter of the breed, Davis encourages others to give to the Foundation to preserve and enhance the present for the future. Davis and his wife, Mary, live in Starkville and have three daughters and five grandchildren. Walton-Berry Graduate Student Support Grant supports graduate education with an emphasis on genetic improvement of livestock. The fund originally started by Jim Berry of Wildberry Farms honors Dr. Bob Walton’s lifelong efforts in animal breeding and raising Simmental cattle. Walton-Berry Graduate Student Support Grant funds graduate education in research programs to directly improve applied livestock genetics and help build future experts in animal breeding. There are two awards - one for $5,000 and a second for $3,000 for graduate education programs; each recipient contributes to ASA Publication, Inc. regarding their research both SimTalk and the Register. Employment: Creative Director/Owner of Generation 6 Marketing. Emily Brinkman hails from New Bavaria in northwest Ohio. The AJSA has been a big part of Brinkman’s life because her parents Tim and Peg took her and her brother, Kyle, across the US to participate in the Regional and National Classics. She has served on the AJSA Board from 2008-2012, serving as President in 2011. Today, Brinkman owns Generation 6 Marketing, an agricultural marketing, and graphic design business, and is actively involved with her family’s 75 head cow-calf operation. She has donated her graphic design and marketing talents to AJSA and ASF projects since her time as an AJSA member ended. Brinkman believes that each segment of the Foundation (Education, Research, and Youth) supports programs important to the Simmental breeds’ success. The youth program provides a strong foundation for the future membership, but we're also able to give the next generation the tools through education and research to continue the success of the Simmental breed. She also knows the impact the AJSA had on her life. “I strongly believe future generations should have the same youth program opportunities. Not only are youth programs important to me, but also the success and longevity of our breed,” says Brinkman. Mark's family includes his wife Debbie, their daughter Jessica, and their son Alan, his wife Sara Catherine, and two wonderful grandchildren, Ross Alan and Ella Catherine. Employment: Re/Max Premier Group for 15 years, previously ABS for 22 years. Mark grew up in the dairy business until 1988, raising Registered Jersey cattle with his brother Neal and father Ezra Smith. In 1972, he learned to AI and began AIing his neighbors' herd of Simmental cattle. At this time he learned how much performance the breed offered. In 1988, after dispersing the Jerseys, Greg Brown, a Mississippi Simmental breeder, assisted him in getting in the breed. Mark purchased his first Simbrah in 1989. Jason Todd and Jennifer Rogers introduced the Regional and National Classics to the Smith's as they were showing some of the Smith's calves, and invited them to tag along. Once they realized the AJSA program was more than a cow show with the contests such as judging, sales talk, quiz, and speaking, they were hooked! It is the only show they attended that more kids were winners other than just the Grand Champion owner. The AJSA is so much more than the show. Character building, leadership development, work ethic, people skills, plus making a lot of friends for all involved. The Smith's children, Alan and Jessica, benefited greatly from the AJSA program. It is truly priceless, and that is why we give to the Foundation. Not only that but you can earmark your giving, and the Foundation board will use it where specified. AJSA youth is the best investment for Foundation dollars there is...my kids are living proof. Profiles will be added weekly! "Simmental's American Journey" is here. Order Your Book Today! Go to www.simmental.org/book to order your copy. Excerpt from the Foreword written by Dr. John Pollak. "The reader of this book will gain knowledge of the history of the Simmental breed, the Association and the people behind the breed. Embracing the story of Simmental in the United States beef industry may help create a sense of accomplishment and relevance that current membership can take pride in as they carry the banner of the breed forward. But there is also value in studying history. Generations of cattle and of the ranchers and farmers who produced those cattle have come and gone over the past 50 years. They faced cyclical cattle markets, environmental and social issues, and challenges that come from moving an organization and a diverse membership forward. They made mistakes and at times got off course, yet learning from these miscues prepares today's leaders for making future decisions. Bold decisions were made that created positive change and should instill confidence in future leadership as they seek to be innovative in new endeavors. The constant threat in the past is that they continued to adhere to the core principle of data collection and utilization. Hence, I encourage all who read this book to keep in mind how knowledge of this history will help in addressing current aspirations for producing better cattle while addressing new challenges that face not just Simmental but the entire cattle industry". Paulette Cochenour and Lilly Platts locating photos and researching for the history book. "Simmental's American Journey" will be available for purchase at Fall Focus 2018 and 50 Year Celebration! Stay tuned on how to get your copy if you can't make it to the celebration! Due to objective genetic predictions such as EPDs (expected progeny differences) and indexes, the cattle industry has made tremendous progress in production and efficiency. However, as the models that produce the predictions become more sophisticated and producers understand less of the mathematics behind them, some people are turning off from the technology. This is a problem because, although calculation of modern genetic predictions has become complicated, the precision and reliability of the EPDs have likewise improved. An EPD is defined as the difference in expected performance of future progeny of an individual, compared with expected performance at some base point for the population. EPDs are estimated from phenotypic and genomic merit of an individual and all its relatives. They are generally reported in units of measurement for the trait (e.g., lb., cm., etc.). EPDs are best used for comparing the relative genetic transmission differences to progeny between individuals. What it boils down to is EPDs let a producer sort out genetic differences between animals, eliminating the “noise” of the environment. Some producers think they can do this better with their eyes or just a simple set of scales. This has been soundly proven wrong. The most glaring example of this occurred in Red Angus. The breed was founded based on performance principles in 1954 with performance reporting as a requirement for registration from the very beginning. Although all Red Angus breeders had weights and measures from the beginning, the breed made no genetic progress for over 20 years. That all changed when it began converting this data into information in the form of EPDs. Since the breed started calculating EPDs, the genetic trend for traits measured has improved linearly. Red Angus also studied the phenotypes for various traits and how they compared to the genetic predictions of the population. An example is weaning weight EPDs, which have been increasing linearly. This lines up perfectly with the breed’s adjusted weaning weights, which have improved at the same rate as the EPDs. EPDs have also allowed the breed to beat genetic antagonisms like increasing weaning weights without increasing birth weight. Indexes are an even more powerful tool for genetic improvement. Certified Angus Beef studied when cows were flushed to either low or high $B ($Beef terminal index) bulls and all progeny were fed out and harvested. The progeny out of the high $B bulls were significantly better for all input traits into the index including weight per day of age, age at harvest, carcass weight, quality grade, and yield grade. The progeny of the high $B sires had $48.65 lower feedlot production costs and produced carcasses with $166.82 more value for a total financial benefit of $215.47. The prediction models have also been proven to be unbiased. Cornell University did a retrospective study of the American Simmental Association’s cattle by going back and adding two years of data at a time. They then observed the differences in how cattle’s genetic predictions changed as they went from pedigree estimates through being proven sires. Animals changed up and down as the possible change chart indicated they would, as more information was added to the genetic predictions. They equally moved either up or down demonstrating no bias in the model producing the genetic predictions. If the model was biased, the predictions would tend to move in only one direction. The basic input into genetic predictions is contemporary group deviations, and the models assume there is no environment by genotype interaction. Cornell also studied this in the Simmental population, and the assumption was validated as true. That the models have been improving over time only makes the genetic predictions and indexes even that much more valuable. Genetic predictions using field data were first introduced to the industry with the 1971 Simmental Sire Summary, but those early models were fraught with problems. The early models were based on sires and all dams were assumed to have equal genetic merit, which of course is not correct. Early models also didn’t account for mating bias. The most common case of mating bias occurs when high-priced artificial insemination sires are only mated to producers’ top cows, so accounting for this bias is important. Over time, these and many more problems have been eliminated. However, with these improvements, the models have become ever more complicated and more of a challenge for the layperson to understand how they work. This brings us to today’s modern genomic models, which are light years better than the old models, but the complicated statistics that go into the genetic predictions are admittedly hard to understand. The goal of the genetic predictions has always been to sort out what is genetic—thus will be transmitted to progeny—from what is due to environment. Marker-assisted selection is the ultimate way to determine genetic value because, by definition, genomics are not influenced by environment. Adding genomics to traditional information that goes into genetic predictions—like contemporary group deviations, heritability, and trait correlations—all adds up to predictions that are more precise and reliable. They do a much better job of establishing genetic relationship between animals, as well as identifying markers associated with causative genes, all to improve accuracy of genetic predictions. The whole goal to animal breeding is to improve cattle genetically. This means different things to different people—some are looking to optimize genetics to their environments while others are looking to maximize the genetic potential for traits. Whatever a producer’s goal, EPDs and indexes are the best way to achieve it. Today’s prediction models do an unprecedented job of removing all the noise from EPDs and indexes, allowing producers to make the most informed genetic selection decisions possible. It has been demonstrated time and again that visual evaluation and simple weights and measures are inferior substitutes for modern genetic prediction. Those who ignore objective genetic predictions do so at the long-term peril of their business’ ability to compete. Dr. Bob Hough is the retired executive vice president of the Red Angus Association of America and a freelance writer.